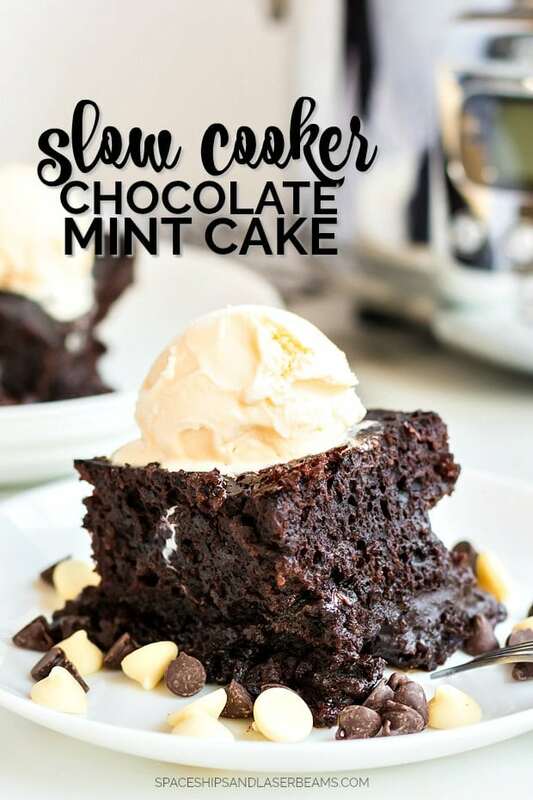 You’re in for a real treat with this recipe for crockpot chocolate mint cake. Molten, gooey, chocolate and peppermint goodness — I think that’s the most accurate description. Plus, it is so easy to put together. I just have to mix up the ingredients and throw them in the slow cooker. Then, leave it to cook. If you’re looking for more desserts you can bake in a slow cooker, make sure you check out our crockpot chocolate caramel cake and our crockpot apple cobbler. For another super easy way to make a cake, try our recipe for chocolate icebox cake — it couldn’t be easier! I am an absolute sucker for anything that’s a mint chocolate combination. Mint chocolate chip ice cream, Andes mint candies, peppermint mocha, you name it, I’ll eat (or drink) it. That’s why this crockpot chocolate mint cake is one of my favorites. I love using my slow cooker to cook this cake. 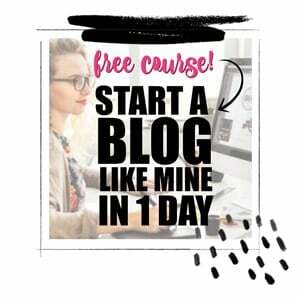 Not only because it makes it really easy for me, but because of the texture that it gives the cake when it’s finished. It’s much different than baking it in the oven. It makes the cake soft, gooey, and in my opinion, more delicious! Best of all, you simply put it together, put it in the crockpot, turn the crockpot on high, and leave it be for about four hours. You do not have to do any baking or pre-cooking of the cake at all. The crockpot will do all of the work for you. Get the full recipe in the recipe card at the end of the post. I use a boxed chocolate cake mix, which calls for water, eggs, and oil. You can disregard the instructions on the back of the chocolate cake box and follow these instructions instead. This recipe uses a five quart round crockpot. You can certainly use a different size, but it may impact your cook time. 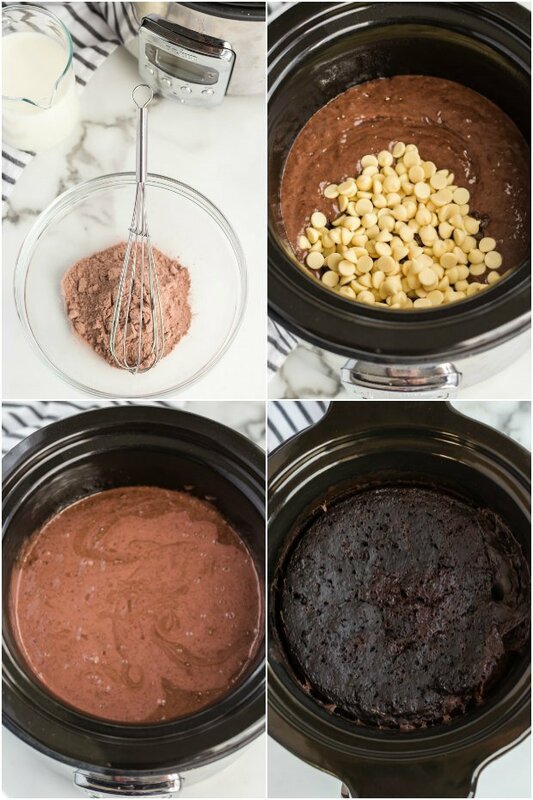 First, you will want to mix up the cake ingredients put into the slow cooker. This will include the chocolate cake mix, eggs, water, oil, and vanilla. Mix these together well before putting the mixture into the crockpot. Next, stir the peppermint extract, white chocolate, and milk chocolate chips into the cake mix in the crockpot. In a separate bowl, mix together the chocolate pudding mix and two cups of milk. Then, pour this mixture over the top of the cake mix. Finally, add the remaining peppermint extract to the top. Then,cover the cake mixture and let it cook up to four hours on high. It’s that easy. And in a few hours you will have the most delicious molten mint chocolate cake ever. Mint and chocolate are already the perfect combinations, so don’t feel like you absolutely have to add anything to this delicious dessert. But I do love serving this cake alongside vanilla bean ice cream. 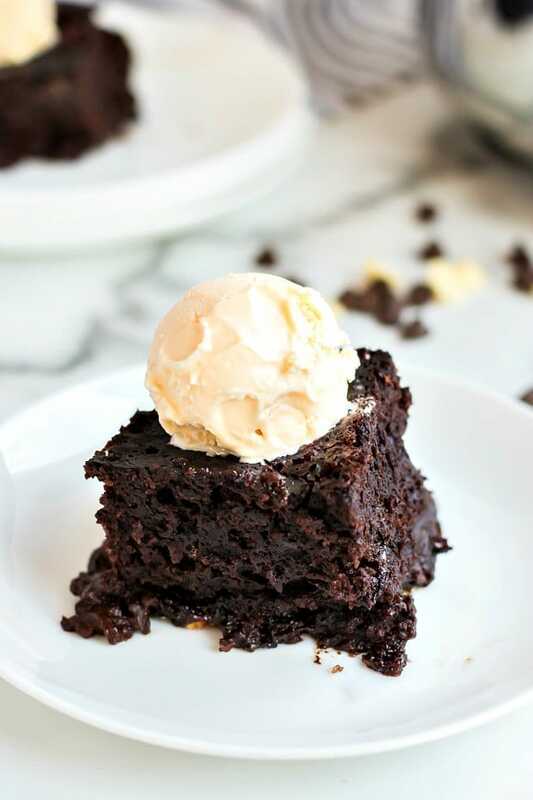 The warm chocolate cake and cool vanilla ice cream are the definitions of perfection. You could also try it with mint flavored ice cream or top with some crushed peppermint candy for a little bit of a crunch. No matter what the occasion: a birthday, the holidays, a baby shower, or a family dinner, this is going to be your new favorite. 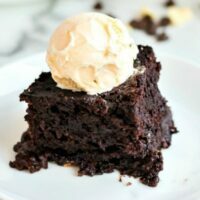 Molten, gooey and filled with the delicious flavors of chocolate and mint, this crockpot cake is a real winner! Stir in peppermint extract, white chocolate chips, and milk chocolate chips into the cake mix. In a separate bowl, mix together chocolate pudding mix and two cups of milk. Pour the mixture over the top of the cake mix. Add remaining peppermint extract to the top. Cover the crockpot and bake on high for 3-4 hours.